Alan Gross, the author of "High Holidays." 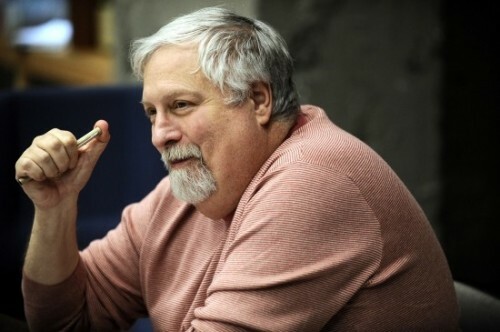 Steven Robman, the director of "High Holidays." Kenneth Kupperer listening to a reading from the Torah delivered by his reluctant son. The family learns that Robby is now Rob and a vegetarian. The Goodman Theater, a beacon in Chicago. 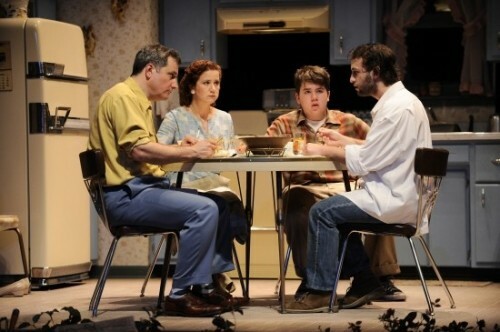 "High Holidays" at the Goodman Theater in Chicago. 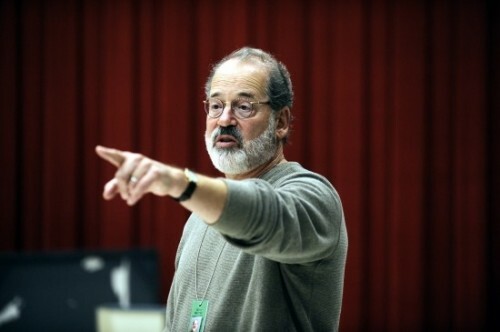 The Goodman Theater presented the world premiere of Alan Gross' "High Holiday," brilliantly directed by Steven Robman. In the Owen Theater at the Goodman, the little theatre, the more intimate setting keeps the audience close to the performrs, and on Friday evening, the brilliant 13 year old actor whose impending bar mitzvah is the putative subject of the play, walked through the audience as he ran away from home. As Billy, the young Max Zuppa, held the stage alone for the first five minutes, imagining he's playing for the Chicago Bears as he provides football commentary, also performing as a radio announcer for the Cubs (we know it's the early sixties because Ernie Banks and Lou Brock are playing). The sports commentary is interspersed with American Indian ritual. Billy lives in Iroquois, Illionois where all the streets are named after Indian tribes and Indian culture seems ripe for adoption. Anything to get away from his bar mitzvah, 67 days away. Yes, he muses, I could become an Indian. His backyard performance is punctuated from time to time by his mother who is cooking dinner inside. The set gives us the yard, the kitchen and living room, and through a cutaway in the roof, a sense of the surrounding neighborhood. This family is not alone. 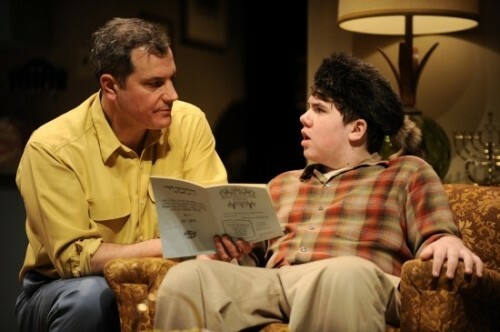 Mom, played by the flexible and charming Rengin Altay, also wonders why Billy isn't in Hebrew school this afternoon. He explains that this is Erev Erev Rosh Hashanah Â– the day before the day before Rosh Hashanah. His mother has never heard of the holiday and thinks her boy may be dim-witted. The father will later agree that Billy doesn't have a full deck of cards, but we know from the start that brains aren't what Billy is lacking. No, Billy is lacking enthusiasm for the reading of the Torah and the preparation of a speech he is expected to deliver as he becomes a man. Brother Robby, soon to Bob Dylan wannabe "Rob", arrives home for the holidays. Ian Paul Custer brings a fragility and hope to the role. Keith Kupperer as pater familias arrives from his own father's shoe store where he fits the underclass in footwear all day long. The play's author, Alan Gross, has himself recently come back from the movies in Lalaland to his hometown, Chicago, and the legitimate theater. The play is a strong announcement that he is back. Mr. Gross has said, "I am all four characters in 'High Holiday'. When my mother died, we had the shards of our family given to us: her collections, our photographs, our books of vacations, as well as my Bar Mitzvah book. I put all of these together and what emerged was a story about growing up...and ultimately, what it takes to become a man." Perhaps this vision holds together the witty and often cacophonous dialogue in the first act. The four family members each have a strong style which survives and even thrives in lines that collide and cross over each other, lines of rapier wit and hilarity. Some members of the audience were offended by that they regarded as an anti-semitic setting. While stereotypes were hurled around, I never felt they were mean-spirited or simplistic. To see this as an ethnic slur is to miss the genuine compassion of the author (and one also expressed in a note by the director Steven Robman, who had gone through a similar experience decades ago). The second act moves away from the incessant dialogue. Instead we are engaged in the passions and hopes of each of the characters. The father is angry because he has made sacrifices to pave the way for his sons. The mother is more yielding, but no pushover. She loves her husband and will obviously stay and have a rewarding life with him. She also understands Rob's need to fly and gives him money to start him toward Berkeley and the future. She is going to help Billy stumble into manhood. There is vibrancy and humanity in this terrific Goodman production. In a note in the program, Robert Loerzel writes about the beginning of the Little Theater in Chicago, one man's wish at the beginning of the 20th century to put on wonderful theater at reasonable production costs and affordable ticket prices. 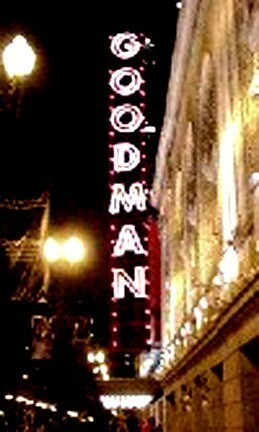 The Goodman certainly honors this tradition and is well worth a trip to Chicago or at least a visit while you are here. "High Holidays" is about to end its run, but the season continues with Brian Dennehy in a double bill: Eugene O'Neill's "Hughie" and Samuel Beckett's "Krapp's Last Tape," and Philip Seymour Hoffman in the world premier of Brett C. Leonard's "The Long Red Road." I am turning right around to come back.